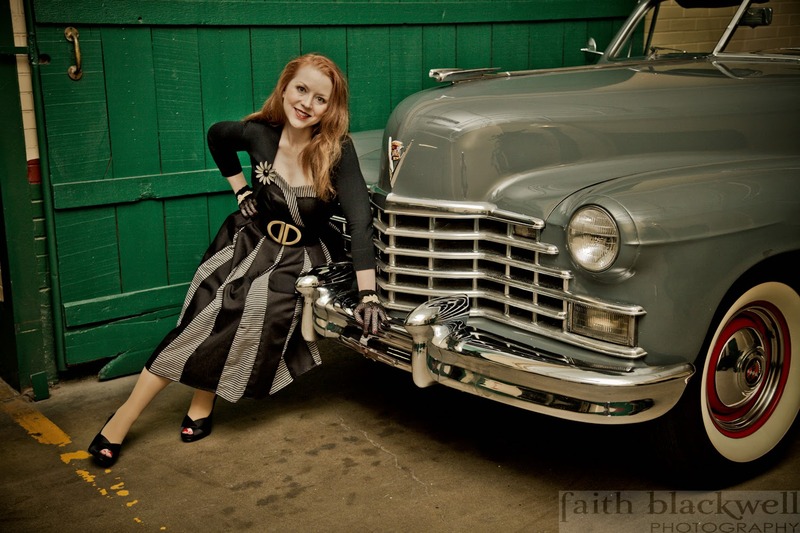 Vintage dress and brooch (N. Rue - sadly now out of business); Photo courtesy of Faith Blackwell Photography; Photo Styling courtesy of Murph Damron; Vintage Cadillac courtesy of The Stutz. I'm one of those people who gets sucked into the imaginary world created by a good book and can't put it down. At midnight, I'll tell myself "just one more chapter and I'll turn off the light and go to sleep." Who am I kidding? My self-delusional statement is as fictional as the characters that dwell within the pages. Consequently, I don't allow myself to read what I call "pleasure books" near as often as I'd like (no, by "pleasure book," I do not mean of the Fifty Shades of Grey variety - I simply mean books selected purely for enjoyment and not because I need to digest them for my day job). My taste is fiction is wildly eclectic, from my favorite classic, To Kill a Mockingbird (predictable for a lawyer, I know), to The Art of Racing in the Rain (a 2008 novel by Garth Stein that uses driving a racecar as an extended metaphor for a husband and father's journey through family tragedy, as narrated by the family dog!) The recent Kindle publication of a new book by Susan Gloss titled "Vintage: A Novel" caught my eye simply because of my love for vintage clothing, and I decided that a little light pleasure reading was perfect for a rainy, cold Saturday afternoon. Set primarily in a vintage shop and featuring colorful descriptions of clothing from the early 1900s through the 1980s, the story focuses on the intersecting lives and personal journeys of three women: a middle-aged single shop owner from the Midwest; the pregnant 18 year old math whiz she takes on as an intern; and an older seamstress from India with a failing arranged marriage and an unnurtured talent for fashion design. Despite their diversity, the three women find common ground through their shared interest in fashion and the challenge of difficult circumstances. It was a pleasant read, though I really didn't feel invested in the characters until I was nearly halfway through the story, and the ending was a little too abrupt and tidy. Still, I'm not sorry I read it, and if you're fascinated by the history and stories behind classic couture garments, you might enjoy it, too. The book also had me thinking about the vintage shops I like to visit, and lamenting that some of my favorites are no longer around. The dress above is from one such store, N. Rue, a former Broadripple staple. The black and grey 50s frock is what's considered in the vintage world as "new old stock," meaning it came directly from a department store or manufacturer and was never sold to a consumer. The horizontal stripes on the inverted pleats are my favorite detail, and though it clearly channels a prior era (especially paired with frilly gloves and a classic Caddy), I've worn it to church; to a wedding; and to a party and felt completely comfortable and modern. On the hunt for new "vintage haunts," I turned to my friend and fellow blogger Crystal Hammon at Dressed Her Days Vintage. Crystal is a long-time collector and seller of vintage fashion. Remember the "Traveling Pink Sweater?" We have Crystal to thank for the chic 1960s cardigan that still looks au courant on women in their 20s, 30s, 40s, and 50s and is raising money for a great cause. "We've lost some good vintage stores recently, and that grieves me. Even the great ones don't seem to last here, and I think that tells you something about this market. There are very few left that are offering the type of clothes I'm interested in. I try to support the ones that are still standing. In the city [Indianapolis], I don't think you can beat Queen Bee Vintage. [Owner] Jennifer Shirk has a real eye and she knows how to spot and buy what I consider to be truly vintage. She's also got a track record of longevity, which is something you have to respect when you know how difficult retail is. I've made a few good discoveries at the Midland Antique Mall, too. I also shop Goodwill. I'm very excited about the new Vintage Vogue store they are opening at the corner of 62nd and Keystone in June. It will be similar to the one in Bloomington, but adjusted for this market. That should be a very well-curated collection, especially at the beginning when they'll be hoping to make a splash locally. Goodwill has trained people in all their locations to spot high quality vintage items that are right for this store, but if you're someone who likes the thrill of the hunt, it will still be possible to make discoveries in their regular stores. They have a small space and can't stock every vintage donation that's made in the area. For people who want to go straight to the good stuff, this should be a wonderful resource. This last tidbit was a revelation - I had no idea that Goodwill had specialty vintage boutiques. You can bet I'll be headed to Vintage Vogue in June, and I'll be checking out the Bloomington location next time I'm down there, too!